Coordinators: Stewart Mart A., Coclanis Peter A. 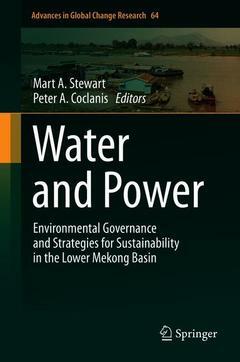 This book brings together a talented international group of scholars, policy practitioners, and NGO professionals that explores a range of issues relating to environmental, developmental, and governing challenges on the Mekong, one of the world?s greatest rivers and, alas, one of the most endangered. The book is divided into three sections devoted in turn to historical perspectives on the Lower Mekong Basin. Issues relate to livelihood strategies, environmental threats, and adaptation strategies; and various aspects of river governance, with individual authors treating questions of governance at different levels of refraction and in different registers. The result is a fresh and innovative collection of essays, which, taken together, provide much-needed new perspectives on some of the most important and seemingly intractable environmental and development issues in contemporary Asia. Preface.- Introduction.- Part I History and Environment in Indochina.- Part II Farmer Livelihoods, Strategies for Sustainability, and Adaption to Environmental Change.- Part III Governing Water: Values, Institutions, and Structures.- Conclusions.